My favorite recordings just keep popping up in this thread! 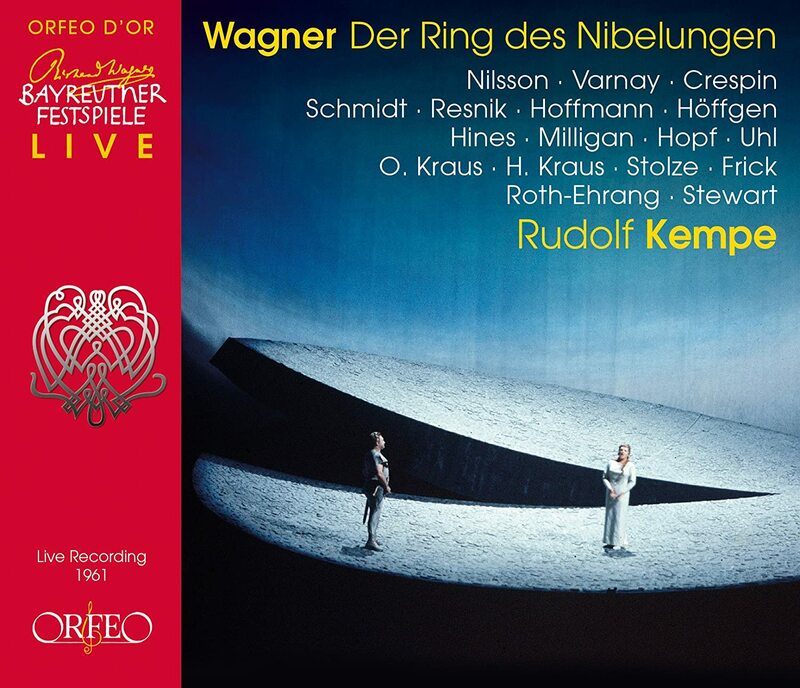 Karajan's Falstaff and Kempe's Lohengrin are my favorites of those operas. Guess I'm a bit predictable with recordings, eh? Massenet Werther. 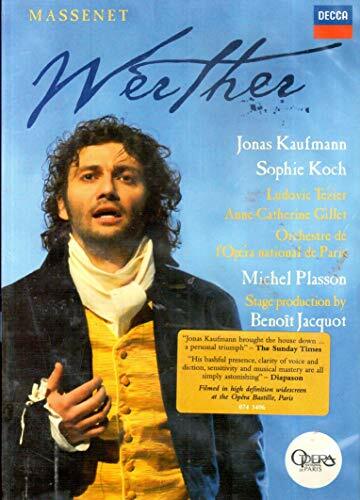 This is a very nice production on DVD/Blu-ray with Jonas Kaufmann as Werther and Sophie Koch as Charlotte. The staging proposed by the (famous) film director Benoit Jacquot is very effective, and Michel Plasson a la baguette is hard to beat in this repertoire. The only annoying thing is the excess in camera movement. This unfortunately is often the case in filmed opera. Kaufmann who has been criticized at times on GMG is an excellent Werther. He has the physique, a certain fragility in the voice that fits the character perfectly. I also find Sophie Koch perfect in Charlotte. Sweet & tender. I don't dislike Sutherland either, but, as I pointed out in an earlier post, she is not a singer who really "speaks" to me. I have very few recordings of hers, but I do have a lot of recordings of bel canto operas, which of course include the operas of Donizetti. I do have her recording of La Fille du Regiment, which is delightful, though, even here, her mushy diction bothers me somewhat. Pavarotti is superb, even if his French isn't that good. I think it's one of his best recordings. Other than that, the bel canto operas I have are. There are cuts in many of these too, particularly the older recordings, but I'll put up with them for the exceptional performances. BTW, you may remember I asked about the Callas Remastered box some months ago on TC. You will be happy to know I did get it, although, the vagaries of listening being what they are, I have yet to listen to any of it. You will be happy to know I did get it, although, the vagaries of listening being what they are, I have yet to listen to any of it. I did not get the full box, just a couple hires CDs in digital form. As far as I can tell, there is no improvement over the Callas CDs I have. Marketing does wonders !! There were enough Callas studio recordings I did not have, that for me it was justifiable. The library did get a number of donated Callas CDs, I must admit. Well. I have heard both Sutherland recordings, the (abridged) Suliotis, the Scotto, the Caballe and the Bartoli (please never again), but have never felt the need to own any of them. Caballe's Norma is best represented by a DVD, which I do have, of the Orange production (with Jon Vickers). She was on fantastic form that night, and I really enjoy it, even if it is a rather old fashioned production. Again, I've also heard some of the more complete, more modern versions of "Turco" , but, set beside the effervescently light Callas version, they all sound a bit po faced, which is why I've never felt the need to actually buy one. The same with the more modern versions of Lucia and I Puritani (I quite like the Caballe versions), and I can always listen to them on Spotify. Too much Callas! But then, you knew I'd say that. How do you like the Algiers on that list? It's a hole on my list. Again, I've also heard some of the more complete, more modern versions of some of "Turco" , but, set beside the effervescently light Callas version, they all sound a bit po faced, which is why I've never felt the need to actually buy one. The same with the more modern versions of Lucia and I Puritani (I quite like the Caballe versions), and I can always listen to them on Spotify. I quite understand how you feel about Bartoli. She seems good only on recital discs, although her Sonnambula was fairly good (it helps that JDF is the tenor), but definitely not comparable to Callas. Did you ever try Sills's Norma? Or the Garanca Capuleti e Montecchi? And there is DiDonato's Cenerentola, which I have on CD (Naxos!) and DVD (a Barcelona production that ends on a sour and stupid note, but again JDF helps make it better). And on another entry in that list, did you ever give Netrebko's Anna Bolena DVD a try? Netrebko seemed better than usual in that one, I think, and the production is a rational one. Currently can't listen to a whole opera, but here's an aria that helped launch my interest. I credit Tom and Jerry for much of my love of opera (and classical in general). Pavarotti helped cement it on a live broadcast from Lincoln Center many years ago. But this aria is one I've known since I was a kid from various sources. Here is a more modern performance that I have enjoyed and still enjoy (not perfect, but then nearly impossible to be that, especially live). I usually have to listen to it more than once! There can never be too much Callas! But then, you knew I'd say that. The Algieri was a bit disappointing, to be honest. I saw Baltsa in the role at Covent Garden, and she was hilarious, but this Abbado set is a bit dull. Yes I have heard Sills as Norma, and she lacks grandeur for me. I have the same problem with the Donizetti Tudor operas. Intelligent artist though she was, the voice was just too pallid and soubrettish for much of the repertoire she sang. Personally, I think one of her most successful recorded roles was Manon, which suited her voice much better. DiDonato I like better in the flesh than on records, so I'd probably prefer the DVD. She is a superb actress with an electrifying presence, and has a tremendously solid technique. I just don't find the voice itself that interesting. I do think she's one of the most exciting performers in opera at the moment though. I'm not a fan of Netrebko, and I don't like her in the bel canto repertoire at all. She simply hasn't got the technique to get round the notes. I've seen bits of her Anna Bolena, and I just can't get on with all that scrabbling on the floor that passes for good operatic acting these days. Anna is a queen, for heaven's sake, and should have more dignity. I also prefer Sills's Giulietta to Netrebko's. If I were looking for an alternative to the Patane recording, then I would no doubt go with Gruberova and Baltsa under Muti. Both Baker and Baltsa make more of an impression as Romeo than Garanca, whom I find rather uncommunicative. The E flat major comes out seamlessly from the initial audience's noise. A very promising incipit. I've seen bits of her Anna Bolena, and I just can't get on with all that scrabbling on the floor that passes for good operatic acting these days. Anna is a queen, for heaven's sake, and should have more dignity. Dimitria Theodossiu (who has the technique to go with the notes, and is a true heir of your beloved Callas) camps a totally mad Elisabeth I, which is the exact vision of Donizetti's british royalty. 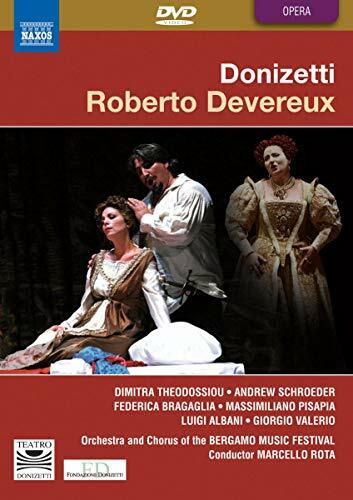 Devereux is probably the least successful of Donizetti british-inspired opera. But if you like Callas, try Dimitria Theodossiu, she is quite something. Anna Netrebko is fantastic in the russian repertoire. True she sings all her heroin in the same Netrebko way, but can said of many, if not all, opera singers. I don't think it has anything to do with being British. It's just remembering a simple truth about a character. Callas's outburst at Giudice ad Anna is a million times more intense than Netrebko's, well a million times more intense than anyone's really, and the miracle is, she achieves that by singing exactly what Donizetti wrote. If photographs are anything to go by, she also didn't have to resort to rolling around on the floor. Callas's genius lay in her superb musicianship (she was probably one of the greatest musicians of the twentieth century) and her ability to reveal character just through the notes on the printed page. I just watched some of Theodossiou's Elizabeth I on youtube, from two different productions. I'd say that, however mad she plays her, she never forgets she is a queen either. Netrebko's Anna is altogether too modern, too vulgar. I had similar misgivings about her Violetta. In an interview somewhere she spouted some nonsense about playing a more assertive, more modern Violetta, pushing people around in the first act, which is all very well, but it goes against the music, and has nothing to do with the Violetta Verdi wrote. Would an assertive, powerful woman give in so easily to Germont's parochial morality? I very much doubt it. Too many producers these days do all sorts to impose their vision onto a piece, without considering the composer's vision. I have no objection to updatings or drawing parallels with different ages from the one the opera is set in, as long as it doesn't go against what the music is telling them. What's the sound like on this, considering it's an old one? Still on my Verdi binge, I move to Verdi's sprawling, uneven masterpiece, La Forza del Destino. The Preziosilla scenes tend to outstay their welcome for me, but they do add a sort of Shakespearean sweep to the opera, which, though mostly tragic in vein, also introduces us to the comic figure of Fra Melitone, brilliantly played by Renato Capecchi on this recording. an unparalleled musical sensibility and imagination, subtle changes of tonal weight through the wonderfully shaped set-pieces, and a grasp of the musico-dramatic picture which is unique. (Lord Harewood in Opera on Record). Rossi-Lemeni is a sympathetic and authoritative, but woolly voiced Padre Guardiano, Tagliabue a bit over the hill as Carlo and Tucker a forthright, virile presence, though he has a tendency to sob and aspirate in, one assumes, what he thought was the Italian manner. No matter, the great moments are all with Callas and Serafin, the whole scene from Madre pietosa vergine to La vergine degli angeli a locus classicus of her incomparable art. Quite good, I'd say. 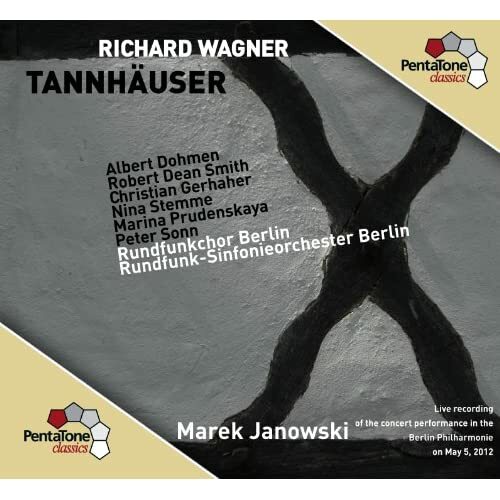 It's a mono recording from the Bavarian radio broadcast archives, recently remastered. In terms of sound, I've heard much worse things from the Green Hill than this one. And also in terms of performance.